Sunday mornings from 8:30 a.m. - 12:30 p.m.
Children will meet to hear appropriate lessons centered on God’s Story, presented by our trained teachers with manipulative materials that allow children to internalize and ponder the great mysteries of our faith. Please click here to register for Ages 4-6. Children gather together in a Montessori learning space called an atrium to discover and grow in their faith through liturgy and scripture. Age appropriate lessons centered on God’s Story are presented by our trained teachers with manipulative materials that allow children to internalize and ponder the great mysteries of our faith. Registration will remain open throughout the year as long as space is available per Montessori guidelines. The Level II class for Ages 6-9 is full. Please contact Gabrielle Ott to be placed on the waitlist. 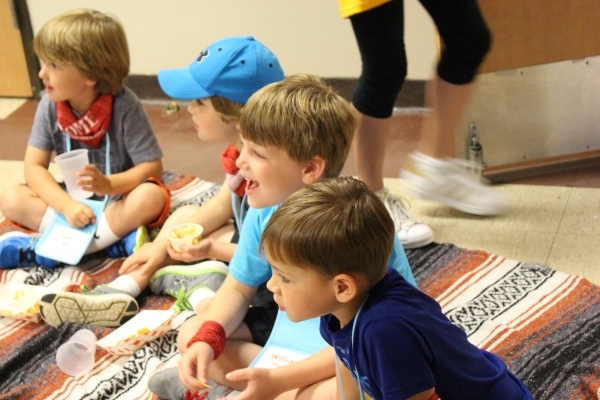 Children are able to interact with the Bible and participate in activities, interactive games, and creative crafts that will deepen their understanding of God’s Story. Please register here. Lessons will feature visual icons, vibrant maps, and instant activities to capture attention and help apply Biblical teachings that provide relevance for preteens. Please register here. Child care is available at Saint Michael for church-sponsored activities. There is a two-family minimum for reservations. Reservations must be made 2 weeks prior to the event. Please contact the event coordinator or a designated contact person for the event you are planning to attend. For questions regarding child care for church events, please contact Carol Hicks – [email protected]. To learn more about God’s Story, click here or watch this introduction video by our Rector Chris Girata.